The subject of climate change has undoubtedly become a major issue in today’s world development agenda. Climate change has been explained as changes in composition of the atmosphere - increased greenhouse gases and aerosols. This has widely led to warmer surface temperature – land, ocean, changing precipitation patterns, reduced Arctic sea-ice, retreating glaciers, melting ice sheets, Higher sea levels – higher storm surges; increased cyclones/ hurricanes in the Atlantic, More frequent extreme weather events - heat waves, floods, droughts. The effects of climate change are increasingly threatening the sustainability of the environment. Evidently, it has provoked very serious and grievous social impacts. For instance, climate change effects have led to deepening unemployment. Ashaladja is a community in Ghana where agriculture which is the key source of livelihood of the inhabitants has been adversely affected the over 5,000 indigenes. Strategic Youth Network for Development (SYND) in October, 2010 did climate change education and tree planting exercise in the community with support from the World Bank Institute and British Council. We observed during a tour in the community that Farm lands have been destroyed due to the main river of the community overflowing its banks. Crops such as Cassava, Yam, Cocoyam, and Plantain are unable to be harvested. Thus the youth including young women have become jobless and are forced to engage in deviant behaviors such as armed robbery, prostitution, and drug abuse as means of survival. Again, the influx of young people from the rural to the urban areas as an attempt to escape serious droughts has denied development in those rural areas. Indeed, if the able, talented, energetic and vibrant young people are hurriedly leaving for the city or urban centers, then how can development take place in those communities? This signal is posing a threat to the future of these communities thereby denying the possibility of eradicating poverty. The negative social impact of such development may not be quantified. In Ghana, social interaction is a form of bonding for most community dwellers; it is common to find family and relatives performing domestic chores in common – either at home, market or community centers. Vocations such as fishing, cooking, farming, washing, and building are done in solidarity. Unfortunately, climate change is breaking such ‘sacred’ bonding that community dwellers have enjoyed in harmony over the period. For example, in times of drought, people predominantly engaged in farming must necessarily split to go seeking for other source of livelihood even if it means relocating. Parents no longer have quality time with their children thereby not able to inculcate in their children the necessary values and principles needed to forming the right attitude in life. When children become wayward, their actions and/or inactions may be detrimental to society. Women are tasked with the pain of walking several kilometers to access water for domestic chores. Husbands may not be willing to devote all the needed support and care that their wives deserve in the name of striving for survival. Climate change consequences seem to be orientating community dwellers to becoming more individualistic instead of collectivity – to wit “everyone for himself, God for us all”. The quality time that existed among people through interaction is fading out slowly but steadily. The bonding and solidarity that is systematically loosing its hold is leading to negative social impacts. The cultures of some communities have also been altered due to Climate change effects. Aboakyire festival is one of the well celebrated festivals in Ghana. A key highlight of the festival is the hunting of a live antelope. The inability of hunters to grab an antelope dims the light of the festival. This specie is increasing becoming extinct due to climate change hence what will be the future of this festival? Will this festival be aborted in the near future? Time will supply. Kpoikpoi, is another festival celebrated by the Gas of Ghana. It’s a celebration of bumper harvest and thanksgiving to the ancestors or gods. Usually, maize or corn is cooked and prepared with palm oil. The head of the family takes the lead after the meal has been prepared and sprinkles them at the door steps of all the rooms in the compound before everyone is expected to eat the meal. The food sprinkled at the door steps are expected to be eaten by the ancestors or gods. Climate change is succeeding to truncate this festival. Changes in weather pattern have affected planting and harvesting of corn. Rainfall has become unpredictable thus putting farmers in a very confused state – not knowing the right time to sow or farm. 1. Families living in communities should be educated on how they can mitigate and adapt to the climate change. 2. Young people working in the agriculture industry should be empowered through capacity building to employ more efficient and effective methods or approaches to successful agricultural practices. 3. Stakeholders in the private sector and prominent individual citizens should be encouraged to commit to the fight against climate change by contributing some resources. 4. Young people should be trained, empowered and raised as Ambassadors to champion the fight against climate change through peer-learning, information sharing through social networks (internet blogs, facebook, twitter etc), and community groupings or think tanks. 5. The time, energies and talents of young people should be identified, harnessed and developed so they are deployed to dealing with climate change effects. Undeniably, the war against climate change can not be sustained without the active participation and involvement of young people. Today’s world leaders and other environmental-oriented stakeholders in their negotiations, dialogues, discussions and consultations need to engage their youth throughout the process as they are – needless to say – future leaders. If young people are not actively inculcated or ‘baptized’ into initiates, programs and/or projects on climate change issues, then I am afraid that not only will all these years of time and resources committed be wasted but climate change will triumph eventually and ultimately defeating the task or efforts to achieving the Millennium Development Goals (MDGs) 2015. The National Youth Council (NYC): A bane or blessing? 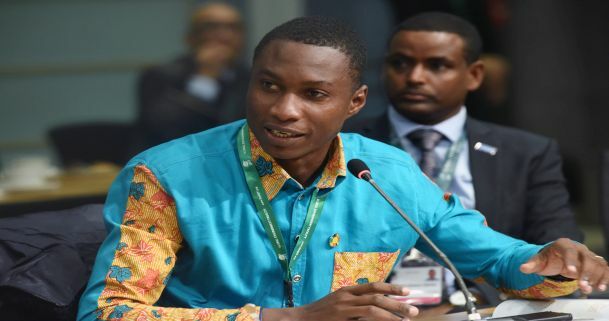 The National Youth Council (NYC) is expected to be the arm of government under the Ministry of Youth and Sports responsible for the organization and development of youth groups in Ghana. The NYC has seen a period of (name-changing) metamorphosis dating back from 1948. It was known as the Ghana Coast Youth Council (GCYC) from 1948 to 1957 which primarily was a representative body of youth organizations. It became known as the Ghana National Youth Council (GNYC) in 1957 when Ghana gained independence. Again, in 1961, a Ghana Youth Authority was incorporated by an Executive Instrument whose significant feature was a direct involvement of Government in youth affairs. After a series of negotiations, dialogues and recommendations with government and other stakeholders, the promulgation of (NRCD) 241 of 1974 led to the establishment of the National Youth Council. Surprisingly, the Youth Council was changed in 1982 to the National Youth Organization Commission (NYOC). The major task assigned the NYOC was the establishment of the Democratic Youth League of Ghana (DYLG) with its children’s wing “The Ghana Edikanfo Movement” as the mass national youth movement. Still again, the era of Constitutional rule from 1992 reverted the National Youth Organization Commission (NYOC) to the National Youth Council to enable it to fulfill its mandate as outlined in NRC Decree 241. I bet no government institution has experience a drama of name changing as the NYC. A Youth Policy however was launched on 21st July 1999 which led the NYC to build the capacity of the Committee of Youth Association of Ghana (COYA) to provide a common front for the youth of Ghana. COYA which comprised registered youth groups with NYC subsequently developed into a loose federation known as Federation of Youth Association of Ghana (FEDYAG). Then in 2001, a youth committee established by Government recommended among other things the review of the 1999 Youth Policy. This baffled me greatly – how can a policy be reviewed when it has not been implemented or tested? On what basis therefore was it going to be reviewed? The “new” Youth Policy (supposedly the reviewed one) was launched in Elmina by the Vice President of Ghana, His Excellency John Dramani Mahama on 12th August 2010 (which coincidentally fell on the International Youth Day). Having gone through all these processes, one would have thought that such exercises would breathe new life into the performance of the NYC but alas! No satisfactory or enviable improvement has been chalked. The NYC is still wallowing in abject inefficiency and effectiveness in professional youth development endeavors. How many people – better still the youth – know where the head office of NYC is located in Accra? If people are more familiar with Azumah Sports Complex than the NYC when both institutions are located on the same premises then obviously NYC might be basking in the thick arms of darkness. Check the NYC’s facilities all over the nation and any enterprising individual(s) can easily generate income or accumulate profit with such resources. Need I say that the Public Relations machinery of NYC is flaccid? Since the launch of the National Youth Policy in August 2010 (over 9 months ago), the NYC has woefully failed to produce a pragmatic dissemination plan for the policy to the Ghanaian youth. Worse still, the policy till date comes with no action plan. What is the relevance of the policy without an action plan? Who is responsible to produce and release the action plan – or it has been hijacked? Did government virtually launch the policy just to achieve some political expediency? Is the NYC and for that matter the Ministry of Youth and Sports failing the better agenda for the youth outlined by Professor Fiifi Atta Mills? A National Youth Stakeholders Forum (NYSF) made up of various youth groups was constituted with its core mandate captured under Article 10.0 of the Youth Policy which states that “The National Youth Council shall facilitate and institute a Youth Stakeholders Forum that will play an active role with an identifiable youth groups at national, regional and district levels in the implementation of this National Youth Policy”. As a result a number of youth groups from different backgrounds voluntarily committed themselves to this worthy cause. The formation of the NYSF at the NYC head office was to also serve as a pilot exercise to be replicated in all the regions and districts to ensure active and comprehensive involvement of youth at all decision-making levels (from national down to community levels). Unfortunately, the NYSF’s engagement with NYC has currently been truncated because the latter failed to produce clearly defined Terms of Reference (ToR) or Rules of Engagement to the NYSF despite requests made. Also, the NYC was reluctant to provide resources for the conveyance of meetings inspite of young people sacrificing their time, energy, and abilities. The young people realizing that NYC was not “serious” aborted the process through positive defiance. With or without NYC, youth related initiatives will continue to take place; after all, we have been educated that “there are several ways of killing a cat”. In an attempt to address such grievances after all internal efforts proved futile, the NYSF issued a press release entitled “IS THERE HOPE FOR THE GHANAIAN YOUTH (NATIONAL YOUTH POLICY AND MATTERS ARISING…) in December 2010 signed by Mr. Samuel Kingsford Seglah and myself being Co-chairs of NYSF. Unexpectedly, this publication infuriated the Board of Trustees of NYC who in reaction summoned a meeting with the leadership of the NYSF. The meeting took place at the Conference Room of NYC on 15th February, 2011. I must also add that the Executives of FEDYAG were also summoned on the same day because they had also written a letter to the Board through the Board Chairperson (Madam Esther Cobbah) calling for the head of the current Deputy National Coordinator (for Programmes and Organization) – Mr. Prince Derek-Adjei. At the meeting, the Board Members surprisingly attempted to rubbish the press release, queried and chided us. At this point, I want to express my personal opinion on this matter being a Co-chair of the NYSF. My opinion therefore does not represent or reflect the collective view of the leadership. At the meeting, the Board imperiously denied us adequate opportunity to respond to issues charged against us which I think is inconsistent with the tenants or principles of democracy. I must add emphatically that the NYSF is not made up of a bunch of irresponsible young people with no aim or vision in life. On the contrary, we are very hardworking, civilized, bravura and enterprising young people representing our individual organizations. We also do boast of respectable and able men and women in society acting as Patrons and Board of Directors in our respective organizations. We have initiated and organized programs, projects and other activities with no support, contribution or single dime from the NYC. Besides, without even wearing my legal hat, I don’t think anybody needs permission to exercise his or her democratic right as engraved in the promulgated 1992 Constitution of Ghana. As a Ghanaian, I believe I have the right to raise any concern I deem fit of course within the confines of the law – unless someone wants to prove otherwise. Indeed, if I had written that press release as an individual, would the Board still have summoned me? If the Board truly possesses such tenacity and ability to ensure that the right things are done, then such energy or strength can best be dispense or expense on the operations of the NYC for better performance. It came to light that, a 3-member Interim Management Committee (IMC) has been constituted to manage the NYC for a renewal period of 3 months. For that reason the then Acting National Coordinator, Mr. Archibald Donkor was asked to proceed on leave. For how long, I know not! Shockingly, 2 out of 3 members of the IMC are said to be Board Members, which only provokes a simple question. Is such an arrangement appropriate? How can “Board members” report to Board members? I fathom that an IMC in an organization must constitute individuals or professionals independent of that organization. Perhaps someone can kindly educate me on this. The NYC by all standards is not performing creditably. It seems to pride itself with little pockets of achievements. Arguably, there are number of ballsy young people across the length and breadth of Ghana who have successfully making strides in their respective endeavors that NYC cannot come close. I have read publications, reports, and features of such young people. I am also aware of the international impacts that these young folks are championing. I can readily vouch for Curious Minds, YES Ghana, Abusua Foundation, Visionaries Foundation, Africa Youth Network, Waves International, Abibiman Foundation to mention but a few who are doing so well inspite of all the difficulties and challenges they encounter. More so, as a Youth Development Practitioner for over 6 years, I have learned and benefited from development partners such as the World Bank Institute (WBI), United Nations Volunteers (UNV), United Nations Development Programme (UNDP), and British Council (BC). In all my dealings with such organizations and other civil society organizations, NYC does not feature or even have a stake. So what really is the mandate is the NYC if they are not visibly involved in youth-led or related activities. Let’s take a random view of the series of youth-oriented initiatives on our TV screens. Which of them (if any) has NYC been part of? Furthermore, is it too much for the NYC to be actively involved in the planning, contribution and success of the National Youth Employment Programme (NYEP) and the National Service Scheme (NSS) whose beneficiaries largely the youth? Even to conduct a simple re-registration exercise for youth groups in Ghana, NYC has shown gross incompetence. So what kwraaa does the NYC exist for? Allegedly, I hear the staff is only interested in travelling to international conferences or programmes on behalf of the Ghanaian youth. Even if such allegations are true, what has been the benefit of such trips to the ordinary Ghanaian youth? Indeed the little said about NYC, the better! For the way forward, the NYC must be rejuvenated and be pragmatically seen as pursuing the agenda of youth development and empowerment in Ghana. Furthermore, I want to propose a separate ministry purposely for the youth. The Ministry of Youth & Sports presently under the leadership of Hon. Clement Kofi Humado is rather more aligned toward sports than youth related issues. It is no wonder that because the youth feel they are marginalized or disenfranchised, the use of aggression and militancy in the name of “foot-soldiering” is the best remedy to address their plight. Is that what we need as a nation? Whiles some nations are earnestly developing and training their youth to take over the world through technological advancements and economic breakthroughs, some of our politicians are aggressively demonstrating to young ones how to carry ballot boxes on their shoulders and sprint with them like cheetahs during elections. The implementation of the National Youth Policy must be without any prejudice or discrimination against anyone irrespective of political affiliations, educational background, economic status, religious beliefs and ethnic sentiments. It should be seen as embracing all facets of the youth. We the youth must be prepared enough to match our counterparts in developed nations in this fast-changing pace in world development. Ghana has already paid too much lip service to this cause; the time to act is NOW! *Guess what; just as I was finishing this article, I got informed that the NYC is now known as the National Youth Authority (NYA) with Mrs. Sedina Tamakloe Attionu acting as the National Coordinator. On that note, I welcome and congratulate her and do hope that she will live up to expectation, produce results and make a difference in the Ghanaian youth.